When I returned from my expedition to Peru and then my time off in Puerto Rico in January 2017, the snow gods had smiled on Colorado and moisture was falling from the sky in a big way. A couple months back, my friend and Australian adventure athlete Shane Hutton had mentioned to me that he wanted to learn to backcountry ski. He had just finished a two year trek down the spine of the North and South American continents, from Banff, Canada to Ushuaia, Argentina, on his touring bike. Having a background in ultrarunning and creating his own adventures, he wanted to expand his repertoire into winter exploits as well. Backcountry skiing seemed right up his alley. After deciding to remain in Colorado to chase the powder for awhile instead of heading back to South America like I had originally planned, I needed a ski partner. I called Shane, who was visiting his sister in Philadelphia and resting from his big cycle tour. He was more than game to come to Colorado and join me in a powder chasing adventure across the state, while learning the ins and outs of winter backcountry travel and safe passage through avalanche terrain. I taught avalanche education courses for six years before I became a professional mountain biker, and it was some of my favorite work I have ever done. I was more than happy to teach Shane how to analyze the weather, terrain, and snowpack, and manage the human factor, to mitigate his risk of dying in an avalanche while playing in the backcountry. 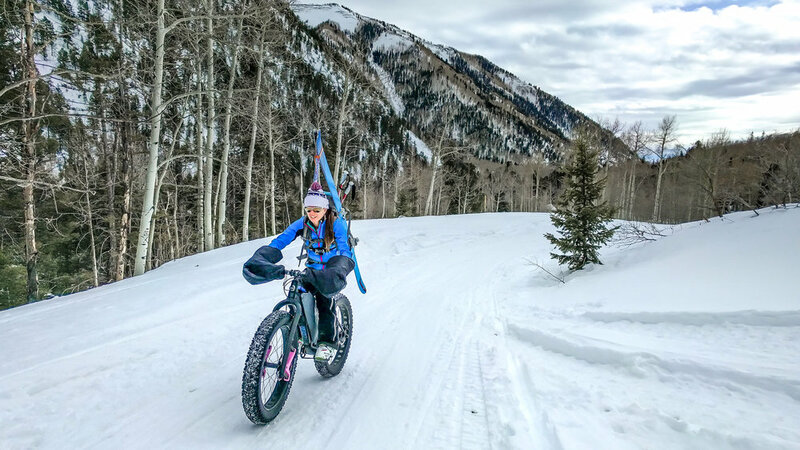 With his solid endurance and strength from years of ultrarunning and cycling, he would be more than fit enough to skin uphill through deep snow for hours on end to find the perfect pitch of powdery bliss. Exactly the partner I needed. Basing out of my permanent home, my 2007 Chevy Astro minivan Suzy (she's not a slow car, she's a fast house), and with my dog Cody Oats as the third wheel, Shane and I traveled through Colorado backcountry skiing, fat biking, with a stop in Moab Utah to ride our mountain bikes and trail run, and ending our adventure skiing my favorite mountain range in the US: the La Sal mountains just outside Moab, where few people go to ski but where I have been privileged to explore many times over the past 10 years. For this trip I was fortunate enough to partner with DPS Skis, and I was on a pair of Wailer 106's in the Tour1 construction. I will say with absolute confidence that this is the best pair of skis I have ever had the privilege of riding. They are incredibly light and feel like feathers on my feet going uphill. And they perform exceptionally well on the way back down. Quick and easy to turn, they floated and danced under my feet like the perfect dancefloor partner I never knew I wanted. If you're a backcountry skier, this ski is well worth the investment. It has been a quiver killer for me, no doubt. I don't need anything else. My fat bike, of course, was my trusty Fatback Corvus. This carbon fat bike with its Lauf fork weighs in at 23 lbs, even with five inches of rubber on both front and rear. Defiant Pack makes the Gunslinger ski carry system to hold your skis and boots right on the bike frame, and it took a little while to dial in the system since I am so small and my bike frame is consequently so small as well, but after I got it working, I no longer needed to carry the skis on my back as I pedaled to the peaks. As always, I hydrated with Skratch Labs hot apples n' cinnamon drink mix. Even though we weren't really sweating, we still need adequate hydration in the winter as it's easy to get dehydrated when it's cold. Having this in your bottles on a cold ski touring day makes me look forward to drinking on the skintrack, and is better than hot toddys around a roaring wood stove in a hut at the end of the day. Well, almost. Shane and I played in the backcountry around Summit County, Durango, Crested Butte, Silverton, Ouray, and the La Sals over five weeks in January and February. I got to dust off the cobwebs and hone my decision making, guiding and teaching skills in the snow. At the end, Shane was choosing routes, breaking trail, scoping lines, evaluating avy danger, and shredding perfect, 35 degree, 2500 ft powder runs through deep north facing tree shots all day long. Cody Oats slept for a week straight when we were done. And I got my skiing fix for the year before heading to Sedona to shred the red for the remainder of the winter.